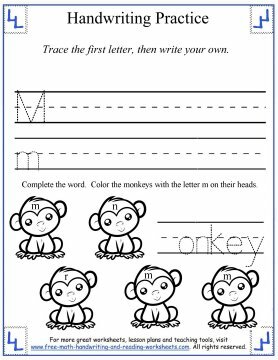 This next unit of handwriting practice sheets will cover the letters M through R.
Each worksheet has a line for printing the upper-case and lower-case letter. 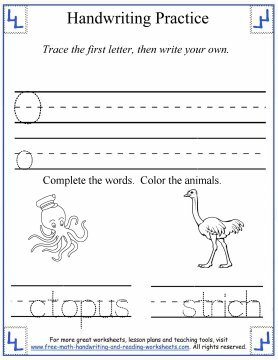 The papers also have a short activity related to the letter that the student will be focusing on. I'll cover the activities in more detail below. 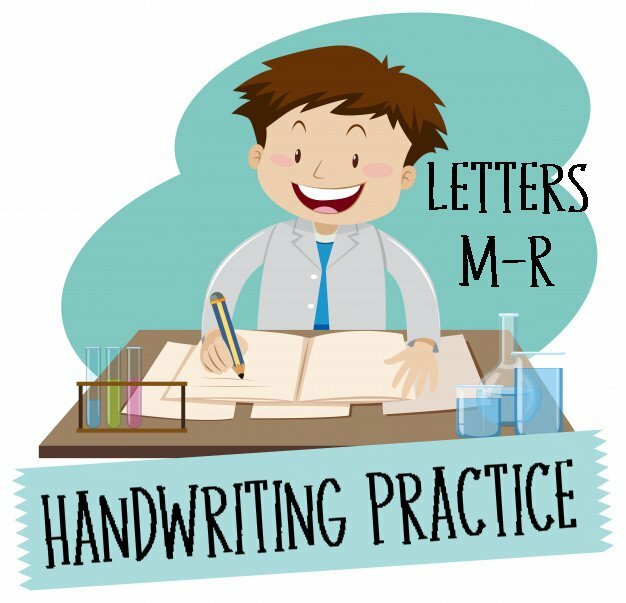 For now, print out the practice sheets and start improving your child's handwriting! Before you can print out your handwriting worksheets, you'll have to download the files. You can do that by clicking on any of the images below. This will open up a PDF file in another tab, just download it and print, then you're ready to go. My worksheets are always free for personal use at home or for teachers to use in a classroom setting. I enjoy creating these worksheets for my children and love being able to share them with others. Thank you for visiting and don't forget to check out the rest of the printing practice sheets at the bottom of this page. 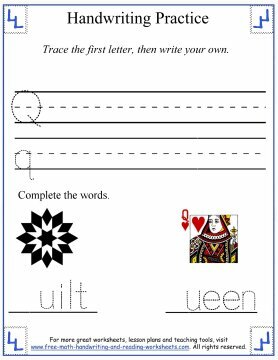 Each of the sheets above has short and simple directions on them, but if you need help with them, here are a few quick notes about the letter activities for each practice sheet. M--Finish the word by writing either an upper or lowercase M on the line. Each monkey has a letter on its forehead. 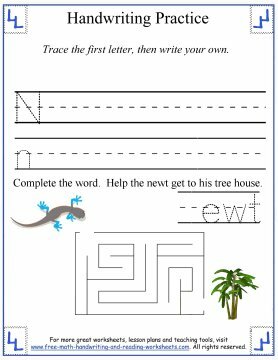 Color in the monkeys with an m.
N--Complete the word, then help the newt find his way through the maze. O--A simple coloring page for children. Write the letter O at the beginning of each word then color in the pictures. P--Each pod has three peas in it. On each pea is a letter. 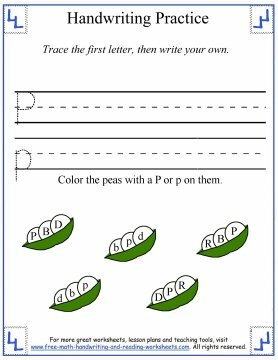 Color the peas that show a P or p.
Q--Just some more handwriting practice at the bottom. Write an upper case Q for the first word and a lowercase for the second or vice versa. R--I thought this graphic added a nice touch of simple humor to the worksheets. 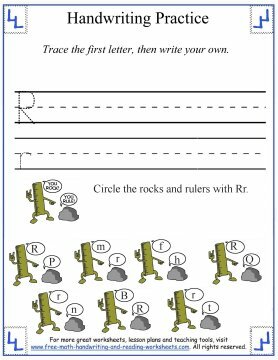 Circle the rocks and rulers that are saying the letter R or r.
For more help with handwriting or letter practice, check out the pages below. You'll find letter tracing lessons and can continue on with the final unit of printing letters S-Z. For students that have mastered printing, I would highly recommend working on cursive writing as well. There are many benefits to learning how to write in cursive. Our son has poor printing skills; he picked up some bad writing habits when he learned to print and it's been a struggle to fix them. Once he learned cursive, his handwriting improved dramatically. He had to relearn how to make his letters which was much easier than trying to 'fix' his printing errors. So if your child has mastered printing or maybe just doesn't excel at printing, I would definitely check out the cursive handwriting practice sheets.